It’s all in the tip! The Diffinity RapidTip functionalized pipette tip contains everything you need for PCR cleanup prior to a sequencing reaction (e.g., Big Dye). The tip is filled with our proprietary adsorption technology that has a differential affinity for PCR reaction components. The impurities (e.g., single-stranded primers and nucleotides used in the PCR process) are removed from the solution as it enters the pipette tip and mixes with our particles. Dispensing the solution yields cleaned, high quality DNA ready to use in your next application. No capital equipment, reagents or buffers, or enzymes — all you need is a pipettor! 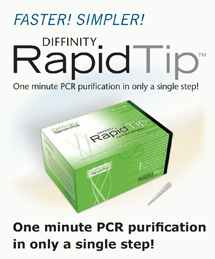 The RapidTip will fit on most conventional single or multiple, or manual laboratory pipettors. Samples containing DNA and PCR impurities are aspirated into the tip where the impurities are adsorbed onto proprietary surfaces within the tip by mixing for approximately one minute. Expelling the solution yields cleaned DNA, the desired product. Recovers up to 90% of high-quality DNA ready to use in subsequent applications. Extremely fast and efficient process to rapidly recover cleaned DNA. Returns cleaned DNA fragments of 150bp to 10Kb. Single step protocol requires little to no training of lab personnel. Waste is limited to the functionalized tip. No extra materials, tips, columns, buffers, or reagents required to clean PCR product. Uses standard pipettor so no changes are needed to your current lab workflows. A single RT025 Tip will clean a PCR sample volume of 20-30 µl. A single RT050 will clean a sample volume of 45-55 µl. Click here to order. To find a distributor in your country click here.